Prime minister Mark Rutte, Minister for Foreign Trade and Development Cooperation Sigrid Kaag, Minister of Agriculture, Nature and Food Quality Carola Schouten, Minister of Infrastructure and Water Management Cora van Nieuwenhuizen and Minister for Healthcare and Sport Bruno Bruins will travel to India from 24 to 25 May 2018 on a working visit and trade mission. 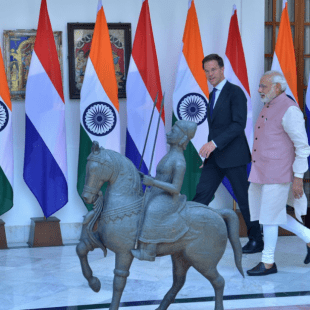 Mr. Rutte will meet with Indian prime minister Narendra Modi to discuss the strategic relationship between the Netherlands and India and the scope for deepening political and economic cooperation. The trade mission will be joined by 220 representatives from businesses and knowledge institutions across 5 sectors: Water management/logistics/maritime, Agri & Food, High Tech/IT, Life Science & Health and Smart Cities. Larive International will also be represented in the trade mission and will, amongst others, focus on 2 Public Private Partnership project with a specific focus on horticulture being HortiTechIndia and FoodTechIndia. Seminar: Double farmers income: the Indo-Dutch Partnership in Delhi under the lead of Minister of Agriculture, Nature and Food, Carola Schouten. In this seminar, the partners of HortiTechIndia will participate in the first session on how to become more resilient to climate change by sharing its view on the feasibility of a Dutch greenhouse in India. The seminar will be under the lead of Minister of Agriculture, Nature and Food, Carola Schouten and the Indian Minister of Food Processing Industries, Harsimrat Kaur Badal. Seminar on the business case of Dutch greenhouse technology and knowledge in Mumbai. In this session, the consortium of HortiTechIndia will showcase under which conditions an investment in Dutch mid-tech equipment is commercially tailored to the Indian context. Seminar: Connecting farmers with market under the lead of Minister of Agriculture, Nature and Food, Carola Schouten. In this session, Mr. Sadashiv Nayak CEO – Big Bazaar, part of the Future Group and partner of FoodTechIndia, will share its experience on how Future Group is providing market linkages to farmers in Karnataka via the project FoodTechIndia. Larive International is honored to be part of this trade mission to India and is looking forward to all exciting activities that will be taking place. Follow us on Twitter to stay updated on all events happening during the trade mission! Dutch Maritime Cluster ‘WaterwayTechHolland’ aims to contribute to the revitalization... Explore your business opportunities for South Korea at 19 June in Zeist.